With her extensive record collection of some 20 000 vinyl and counting, Dutch DJ and producer Marcelle/Another Nice Mess has a strong historical knowledge of past and contemporary underground music. As much inspired by avant garde art movements as fluxus and dada, the real life absurdism of Monty Python as by the wild experiments of dub, post-punk and the latest developments in electronic dance music she has always been following musical developments very closely and has a keen ear for innovative and new sounds. Marcelle is as much, or even more of, a musician as she is a DJ. She is an original, skilled mixer, with a very distinctive style of her own, avoiding most DJ-cliches and stale rules. She also produces her own music and does weekly and monthly radio shows for various radio stations in Europe. After her epic set last December, Marcelle is back at our Club this weekend! Prepare for excellent genre-defying dance music. 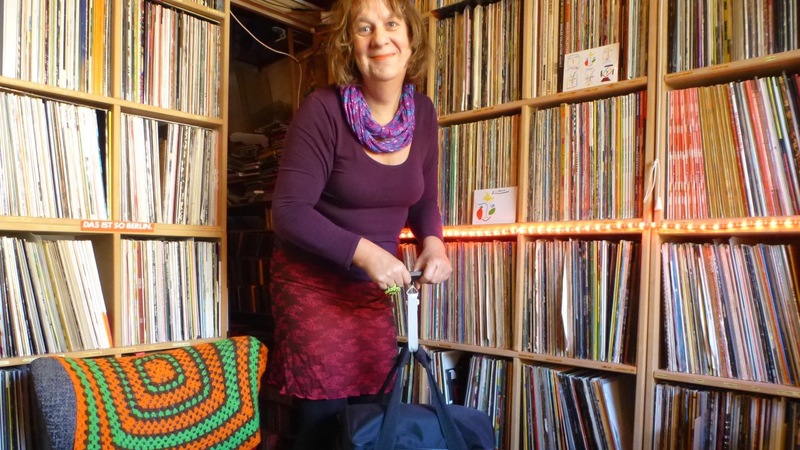 We have asked Marcelle a few questions about her record collection. Marcelle, is it true that you own 20 000 records? How do you manage to keep an overview about your archive? My collection counts some 20 000 vinyls and a couple of thousand CD’s. I store them by genre, and as genres come and go, obviously newer ones are stored next to each other. Having access to so much music, how do you pick tracks for your set? The most exciting new ones I take along, I want my sets to be contemporary, I dislike retro sets, so I just take the newest ones, along with only a few older ones. Do you already know what you you gonna play when you are back at ACUD? I also improvise when I play, so no I never know what I’ll be playing, I also play records simultaneously so I also try to create something new. Where do you usually find and buy your records? I buy them all over Europe, Vienna, Zurich, Athens, Berlin, Paris, depends where I play. Recently I played in Dubai so I bought some local vinyls there. Recommendations can always be helpful to discover new music. Are you following somebody? No in general I discover my own records. I always listen to piles and piles of new records every week and let my curiosity guide me. finding exciting new records takes a lot of time, but because I don’t let no one guide me, I develop my own style and attitude. What’s your song of the week? I don’t do “songs of the week”. I have my own radio shows where listeners can see and hear what my latest purchases are. Check: www.anothernicemess.com. Besides, I also produce a lot of my own music, I just released a new 12″ EP called Psalm Tree, available at my gigs. When Mark E. Smith of The Fall died in January I produced a new song about him, a tribute song called Two Walls. I have it had it pressed as a dub plate so i play it in my sets already before its even officially released.